We attempted the impossible, to see the highlights of Rome in a day, including a visit to the Vatican. While this is not the recommended way to see this historic city, it was our only option, as it was a port on a Mediterranean Cruise. The secret to our success was two-fold. First, we did our research. 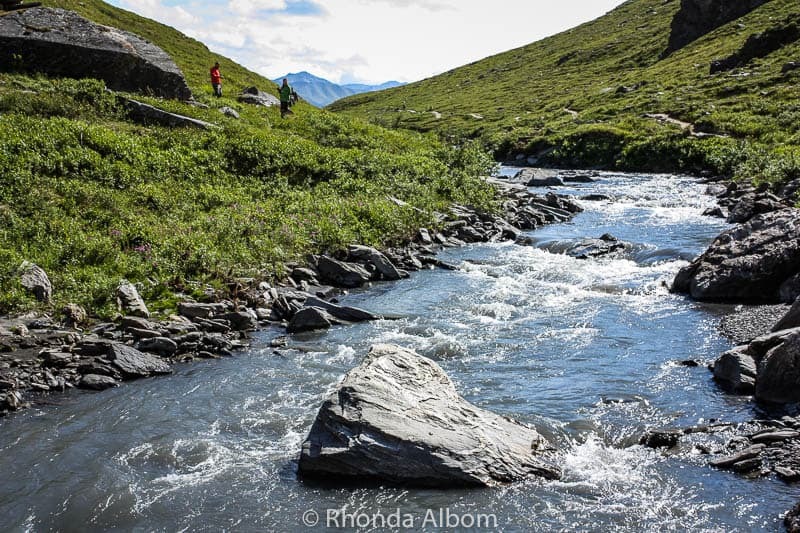 We knew what was here, studied the history, and selected what was most important to us. Secondly, we found a guide that could meet all our needs. He had VIP passes that allowed us to cut the queue just about everywhere. And, he had a driver, so we were dropped off at one destination, and picked up from the next. 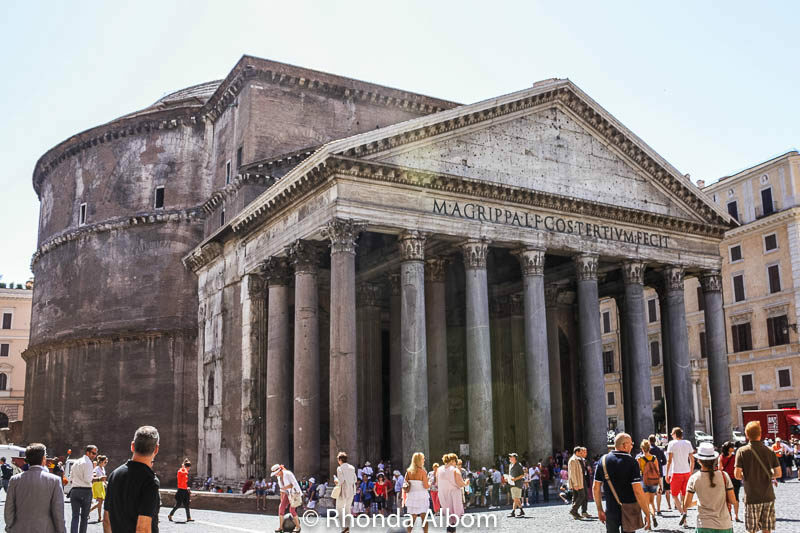 The Pantheon is a well-preserved former Roman temple (now a church) built in 126 AD. Like most places we visited in Rome, the Pantheon is filled with tourists, and getting a photo without them seemed an impossible task. A street scene outside the Pantheon. It’s a great spot for lunch, but we just had sweets. Our guide bought us Cassata, a Sicilian treat. Italy’s Parliament building in the capital city of Rome. The Roman Theatre is an example of classic Greek architecture in Italy. Of course, we stopped to throw coins in Trevi Fountain, a superstition that guarantees our return to the city. 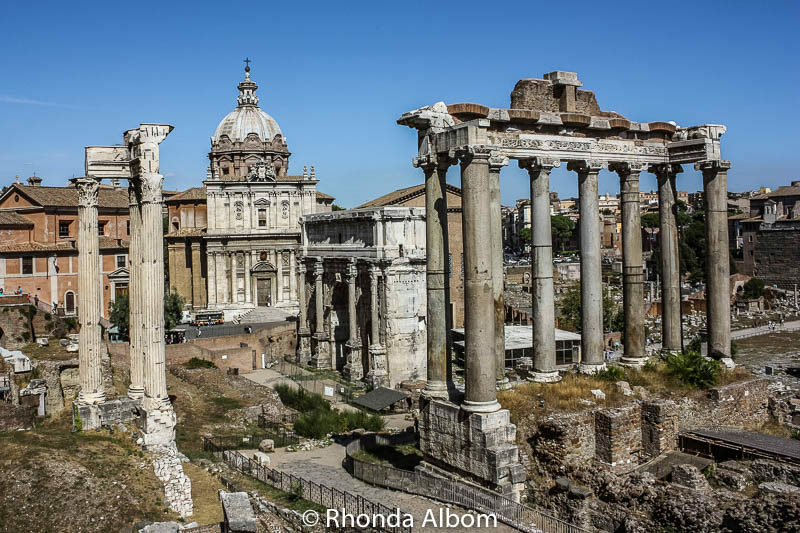 The ruins of the Roman Forum highlight the classic Roman architecture we saw as we travelled through much of Europe. The Column of the Immaculate Conception has the Madonna atop an 11.8-metre marble column. 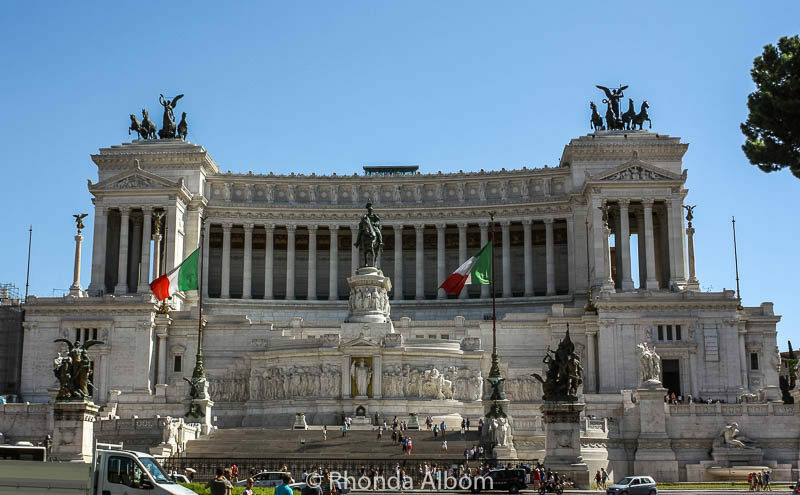 Nicknamed “The Wedding Cake”, the Altare della Patria was completed in 1925 and honors the first king of unified Italy, Victor Emmanuel. 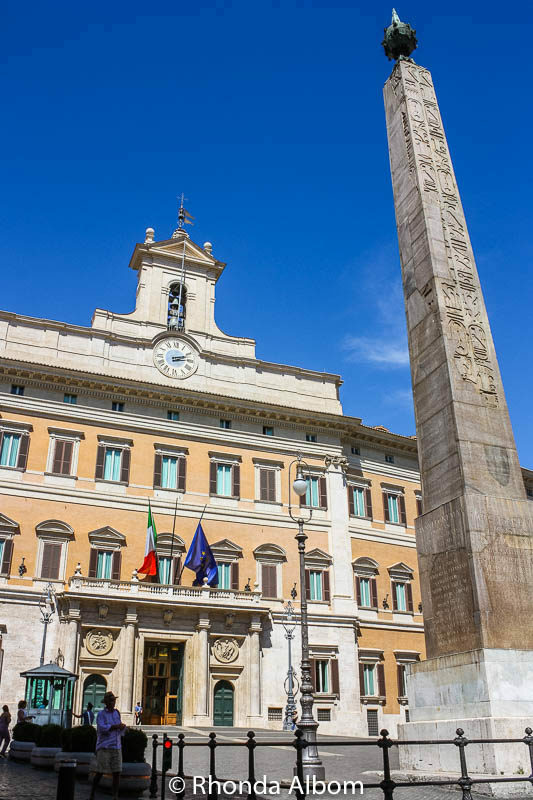 It is also home to Italy’s tomb of the unknown soldier and eternal flame. 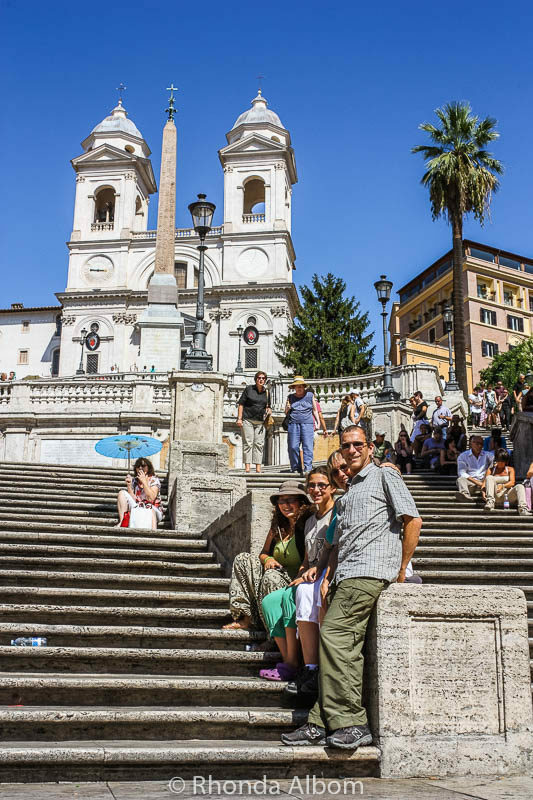 We even found a few minutes to stop and do some people watching at the Spanish Steps. 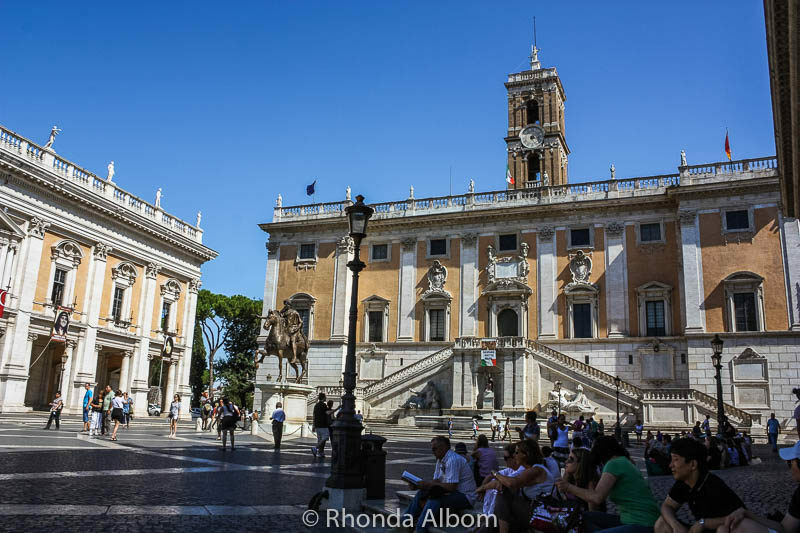 At the top of Capitoline Hill, the most important of Rome’s seven hills is the beautiful Piazza del Campidoglio. It was in part designed in by Michelangelo in the sixteenth century. The Colosseum in Rome (The Flavian Amphitheatre) is still the current Guinness World Record holder as the largest amphitheatre ever built. 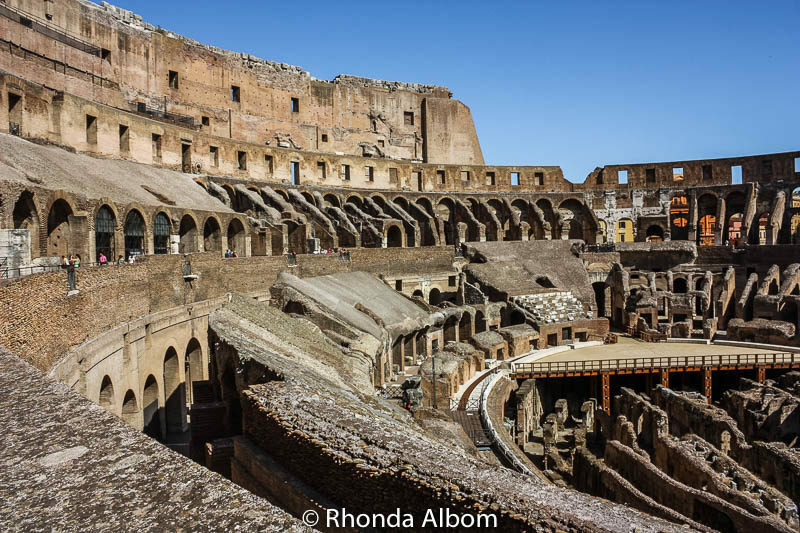 It opened in 80 AD and hosted gladiator battles and wild animal fights. Arch of Constantine stands next to the Colosseum. The 21-meter tall arch was built in 315 AD to commemorate Constantine the Great’s victory over the Roman tyrant Maxentius. The view from Janiculum Hill. Our final stop on an exhausting day was the giant fountain on Janiculum hill. If you are going to try to cram in Rome in less than a week, get a guide. Remember to cover your shoulders and knees if you are going into the Vatican or other Catholic churches in Rome. 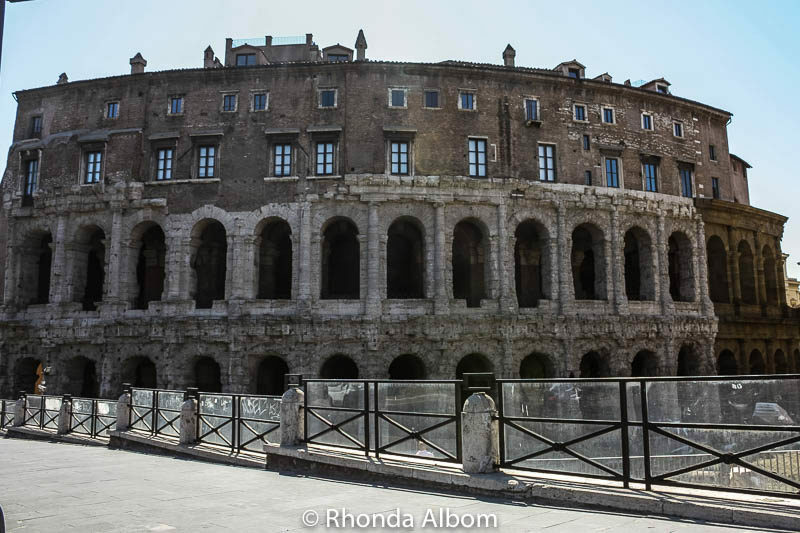 Rome was our third port on a 12-day Mediterranean cruise that started in Spain then headed to the French Riviera. The day before was also busy as we disembarked and visited both Pisa and Florence in a day. Our next stop will be Naples, where we will head to Pompeii. Then we leave the coast of Italy and head to Greece and Turkey before returning. While some days are a bit exhausting, we are enjoying the cruise. If you headed out a cruise, check out this tips. Is it possible to see Rome in a day? What do you consider to be Rome’s highlights? What did we miss? We didn’t have time to visit the Sistine Chapel when we went (we were there 3 days) but we did see most of these. The Spanish Steps were desolate on the rainy days and really came to life the last day we were there, and the sun came out. Such a treat to see your pictures! That was the big advantage of having a guide with the pass that cut the queue. We could get into the Sistine Chapel and Callosum without a wait. Rome is such an amazing city! Though Venice has my heart! Interesting, if I had to choose between the two, I would go to Rome. This is great! I can’t imagine only having one day in Rome, but this is definitely how to do it if that’s all you have. I would hate to feel rushed, especially in the Colosseum, but did cutting the queues make up for it? Cutting the queues made it possible, as did the driver who was always there when we were ready to move on. Pictures are awesome in the blog and by looking at these pics anyone would love to visit Rome. If you get a chance, go longer than a day. The secret to your success were the VIP passes. Being able to shortcut all those lines allowed you to cover a lot of territory. Now you have an idea about what’s there and when you return you’ll feel right at home. Rome is one of those cities I could never get bored of. The first time we’ve been there (in 1989) se stayed for 3 weeks and left feeling that there was so much more to see. The second time (just a few years ago) we stayed for 10 days and left with the same feeling. Well, I guess moving there for a while would be in order. How can you not fall in love with Rome? I loved our day, and it was nowhere near enough time for Rome. It is a city that I could live in for a while. Maybe a few months, as I don’t speak the language. I am amazed you were able to see so much all in one day! Love the photos. My husband has family in the area and we’ve been to Rome twice. This is a place one never gets tired of. 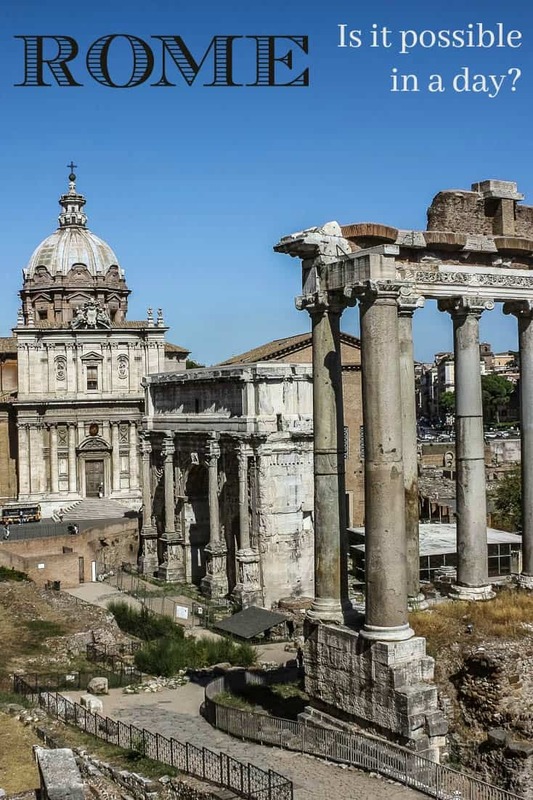 🙂 The Roman Forum and Colosseum were especially exciting for this ancient history buff. If we had family or people to see, we never would have been able to see so much. We didn’t have time to stop and relax, and certainly not enough to visit. But if we did have family, I am sure we would have stayed longer. Great itinerary for the day. We were the same when we did a Mediterranean cruise. It’s not like I wanted to rush to see everything, but wasn’t going to go all the way to Rome and not at least try. Like you say, wasn’t optimum way to see Rome, but still very happy with what we saw. Exactly, when in Rome . 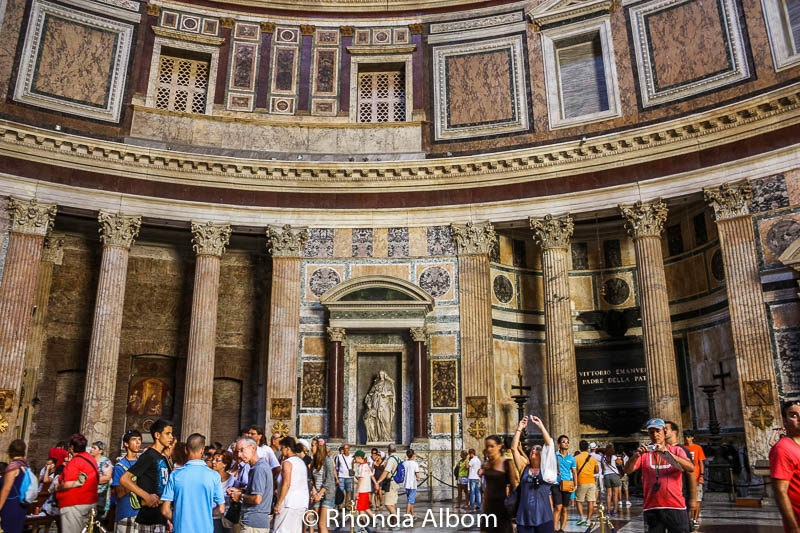 . .
Rhonda, the architecture is amazing in Rome! How amazing to walk the streets of such an old city to see where gladiators fought but it’s also a city that holds a lot of sadness. I think about the countless Christians facing off with furious lions in the colosseum arena. Great photo op and experience. So, glad you shared it with us on WW! Thanks for visiting yesterday! True, I think most places with such a long history have sadness attached. Seeing Rome in a day is very ambitious. I cant think of another city that has as many places to visit as Rome does. 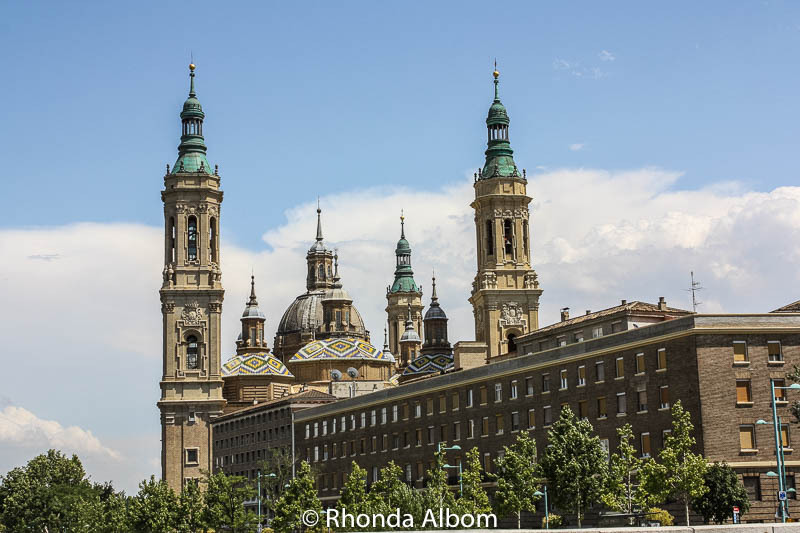 Surely, you can visit the top five sites in the city. We hit more than five, thanks to our guide. Good tips. I’ve only taken one cruise and the amount of time allowed in ports was way too brief. However, it’s a great way to get an introduction to a city. Wow, you certainly covered a LOT in one day! We’d love to take the kids and visit Rome again one day. It’s such a beautiful city. amazing how much you managed to see! Bravo! Thanks Kathe. We were exhausted at the end of the day. I think you did very well! Short time but you saw a lot. I was 4 days and more or less visited the same. Wow! You deserve an award for seeing so much an sharing the pics with us! Funny that the Pantheon has such blackened stone. I wonder why they can’t clean it. The Trevi fountain is awesome and so is the Coliseum! The arch and the back wall of the Coliseum seem to be leaning… You were so lucky to have found a great guide. No way you could’ve done all that without him.! You are so right. Max was the key to our day. Plus he was fascinating. That’s the cool thing about historic sites, 50 years, they don’t change much. Was there a few months ago. Great times. It’s a wonderful city. I have been there twice. You covered a lot in a day! On a trip to London we took day trips to Edinburgh and to Paris. Edinburgh wasn’t to hard to see in a day, but we didn’t get to see much of Paris other than the Eiffel Tower, a boat tour up the Thames and a fabulous meal at a sidewalk cafe. Enough to know I want to go back! The queues in Paris are so long, you can’t see much in a day at all. I passed through Rome on a moving bus in the middle of the night. Never got to see all this cool stuff! So much to enjoy! I’d love to be there right about now. The ruins was my favorite, but they are all so wonderful. I wouldn’t mind being there right now either, for weeks, not just a day. 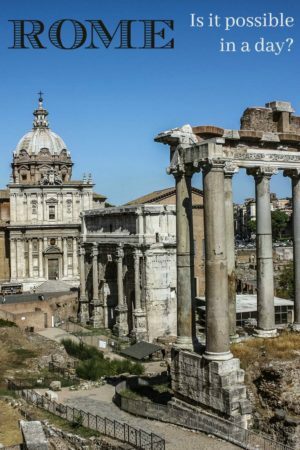 I’ve always wanted to see Rome – now I know how to do it if I have a day there! It’s a long and tiring day. You packed in a lot in one day. That’s amazing it’s the biggest Colosseum ever built. VIP – fast passes are the only way to see anything these days. It’s the biggest amphitheatre ever built. I am guessing that is a narrow definition, and how they were able to keep the title so long. Oh my goodness! What a place to visit. I’m so proud just being an Italian. Even though I’ve never been there, my father was born in the mountains around 50 miles. You must be exhausted seeing as much as you did. The Colosseum in Rome (The Flavian Amphitheatre) was where many Christians died for their religion. Just thinking about that I wonder how I would feel in those days. Thanks Rhonda. By the way, have you ever created a book a book about your travels? I thought you did but I can’t remember. Enjoy your day my friend. See ya. I am sure you will visit one day. I know you like to cruise. Many ships start or end in Rome, so you could tack on some serious time. Don’t try and do it the way we did. As for a book, mine is about Auckland, but he publisher pulled the series a few months ago. I need to change the cover and republish it. Who is injured? Are you okay? Lovely pics as always! Take care! Sarah ruptured her ACL ( the ligament that holds your knee together) in Argentina and has had it surgically repaired here in Auckland. She is doing great, but the recovery is a long slow 9-month process, with no long-haul flights for at least 12 weeks. I love Rome! Wherever you look, it’s all world class art! I made a few visit here, but I have tried to see all the highlights, well most of the highlights, in a day. It was super tiring but I was thrilled and happy! We were completely shattered by the end of the day, and slept well that night. Great shots of a place I’ll never visit. We’re okay with that. Some people love to travel, and others don’t. We’re in the don’t category. That’s okay, I will visit them and share my photos so you can experience them too. Honestly, I would have had a tough choice deciding between the sights in this historic city and a locals day. In most places, I would pick the local cultures, but Rome I am not so sure. You certainly crammed in a lot! Fabulous shots of the eternal city! All this plus the Vatican. I had to look it up again before I republished as it is hard to believe it is still the largest. I am guessing there are bigger ones, but they are classified as something other than amphitheatre. 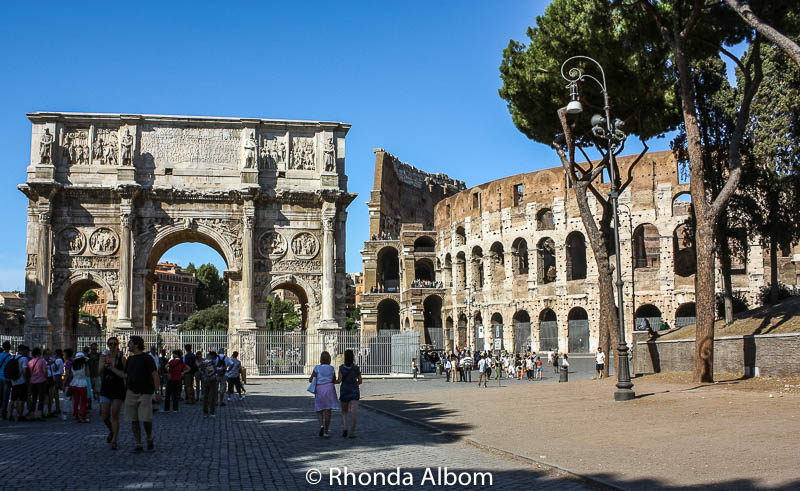 Even as ruins, the forum, Colosseum and arch still retain impressive beauty. What a grand set of photos. Thanks Gemma, Rome is a very photographic and impressive city. I really enjoyed these photos Rhonda love cities especially the old buildings nice photos of you all too. Thanks. Our guide took photos of us at every stop. 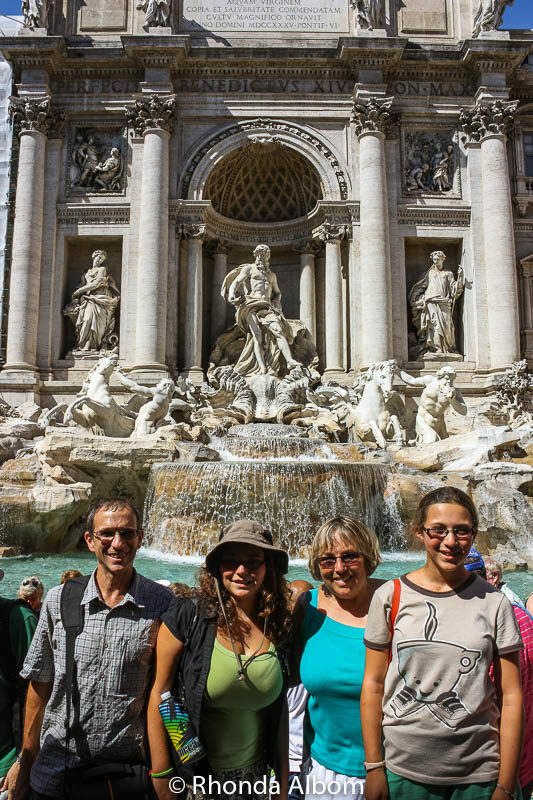 Unlike most places we travel, in Rome, we have several nice family photos. Wow, you sure did a lot in a day. Beautiful photos. I hope I can visit rome someday. Oh, the places you’ve been. . . . I love reading your posts, even if I don’t always comment. You should do a book when it’s done and the dust has settled. I homeschooled my son, and it never occurred to me that a trip such as this was even possible. Your daughters are getting an education like no other. Bravo! Love the pics! Love Rome! I would have love to go along on this day. Would have loved to see all these things. Awesome.